High-Powered Lens, High-Sensitivity Sensor and High-Quality Full-HD 10 Bit 4:2:2 Recording Shoulder-Type Performance in a Handheld Camera for Broadcasting and Production Work. Does not include shotgun microphone in stock photograph above. 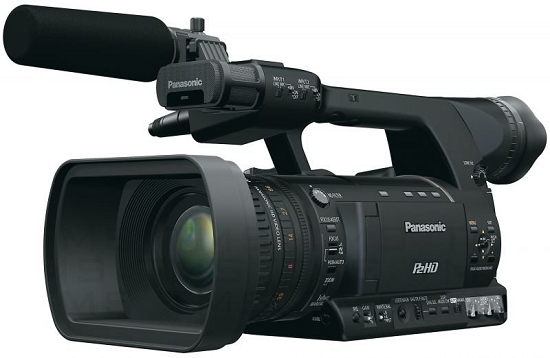 The AG-HPX250 Memory Card Camera Recorder is a new handheld model for Panasonics broadcasting and professional P2HD Series. Incorporating new technology in the lens, camera section and recorder section, this compact unit offers a level of performance that approaches full-size, shoulder-type broadcasting camera recorders. Its also the first handheld model to support AVC-Intra codecs. Combined with the high-sensitivity, low-noise, 1/3-type 2.2-megapixel U.L.T. (Ultra Luminance Technology) MOS image sensor, it enables high-quality recording of Full-HD (1920 x 1080), 10 bit, 4:2:2 full sample broadcast-level images. In addition to covering a wide range, from wide-angle to telephoto, the lens is provided with three rings a cam-type zoom ring, a focus ring and an iris ring for the same kind of manual operation that you get with interchangeable lenses. The AG-HPX250 also features GENLOCK input and TC input/output for synchronizing multiple cameras. Together with HD SDI output, this provides smooth operation in a live relay and recording system for multi-camera broadcasting and production work. A variable frame rate (VFR) function for slow-motion and quick-motion images, and a cine-like gamma setting also bring versatile expression to all kinds of image production. This stunning image quality, operating ease and handheld camera mobility work together to open a new dimension in news gathering and image recording. The AG-HPX250 features the progressivecompatible U.L.T. (Ultra Luminance Technology) image sensor (1/3-type 2.2-megapixel MOS sensor) that is used in broadcast P2HD camera recorders. This image sensor offers high sensitivity and low noise to enable shooting in low light conditions. In AVC-Intra 100 mode, they can record high-quality Full-HD images. The AG-HPX250 is equipped with a newly designed, large-diameter zoom lens, with a filter diameter of 72 mm. This 21x (f = 28mm to 588mm, 35mm equivalent) zoom lens covers a wide field of view, from wide-angle to telephoto, without a conversion lens. The lens is provided with three rings -- a mechanical (cam-type) zoom ring, a focus ring and an iris ring -- for the same kind of manual operation that you get with an interchangeable lens. Offered for the first time in a handheld camera recorder, AVC-Intra is a codec based on advanced MPEG-4 AVC/H.264 moving picture compression technology. It uses an intra-frame compression system to achieve high compression, high image quality and high editing performance. You can select AVC-Intra 100 for full 10 bit 4:2:2 fullsample recordings with 1980 x 1080 pixels or AVC-Intra 50 for video quality similar to DVCPRO HD and twice the recording time. The AG-HPX250 also offers DVCPRO HD, DVCPRO 50, DVCPRO and DV recording. Multi-camera synchronizing: GENLOCK input and TC input/output allow synchronization of multiple cameras. Ideal for multi-camera live relay and recording systems. HD SDI/HDMI output: For broadcasting and professional system operation. VFR (variable frame rate): Enables film-camera-like image effects with overcranking for slow-motion and undercranking for quick-motion effects. 1080 setting: up to 30p, 720 setting: up to 60p (both at 59.94 Hz). HD multi-formats including native 24p. Switching of 59.94 Hz/50 Hz also possible, for use with worldwide HD video formats. 4-position (clear, 1/4 ND, 1/16 ND, 1/64 ND) optical neutral density filter wheel. XLR 2-channel audio input terminals supporting a 48 V phantom power supply. DRS (Dynamic Range Stretch) suppresses blocked shadows and blown highlights. Selectable gamma settings, such as cine-like gamma, for rich gradation. Convenient features and functions include scene file, user buttons and focus assist functions. High-resolution, high-brightness viewfinder and LCD monitor. Two SD card slots enable consecutive recording and hot-swapping. One-clip rec stores multiple, consecutive cuts into a single file. Text memos and shot markers can be added. IEEE 1394 and USB 2.0 (Host/Device) interface.